View More In Case Fans - Page 3. 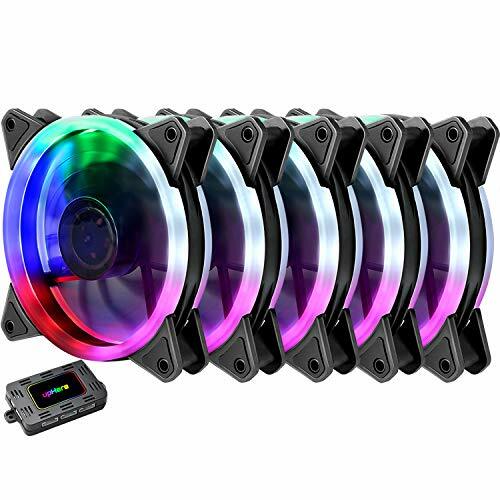 Superior RGB LED illumination effect: Unlimited color transformation, set your fans to stun with static, flash, and fade mode, always beautifully illuminates deep vivid color. LED ring: Maintain color and brightness uniformity. The lighting effect is visible from all directions and adds aesthetics to the chassis. Easy to control: One key to change RGB lights, One button to adjust speed, mode and color with the controller included, One controller can connect up to 8 RGB fans. Custom-molded Blade: The custom-molded blades are translucent with a frosted texture, which adds a dreamy effect to the led lightning. Super Quiet: Equipped with rubber pads and hydraulic bearing, which greatly reduce operating noise and improves efficiency. 1. please do not use our rgb controller to connect other brands of RGB fan. 2.High Airflow: 120 mm fan tuned for high-airflow and large volume cooling. 3.Super Quiet: Equipped with rubber pads and hydraulic bearing, which greatly reduce operating noise and improves efficiency.